Large-flowered Star of Persia and tumbleweed onion add showy sparkle to your garden beds and borders. LIKE THE STARS in the heavens, the Allium family is vast. Botanical cousins include familiar kitchen staples such as onions, leeks, scallions and garlic — did you catch Colin’s ode to garlic in last week’s GROW column? 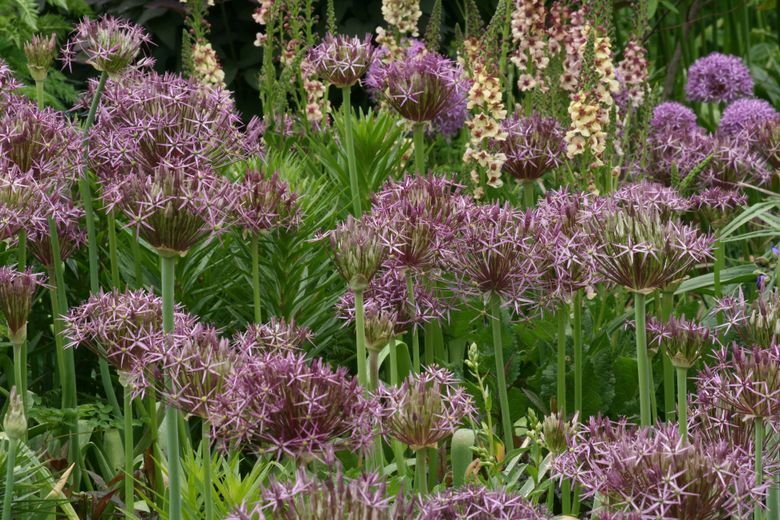 But today I’m talking about ornamental alliums; specifically, large-flowered forms that add sparkle to your beds and borders. Star of Persia (Allium christophii) is a remarkably beautiful and lasting feature that always enchants visitors to my garden. The bulbs bloom in mid- to late spring, producing huge 8-to-10-inch globes of dozens of metallic violet florets, each one centered with a lime-green eye, held atop slender but sturdy stems that grow to about 18 inches tall. Can you say drama queen? Bees, butterflies and other pollinators love the nectar-rich blossoms, and I love the resulting crop of seed that in time produces more bulbs. 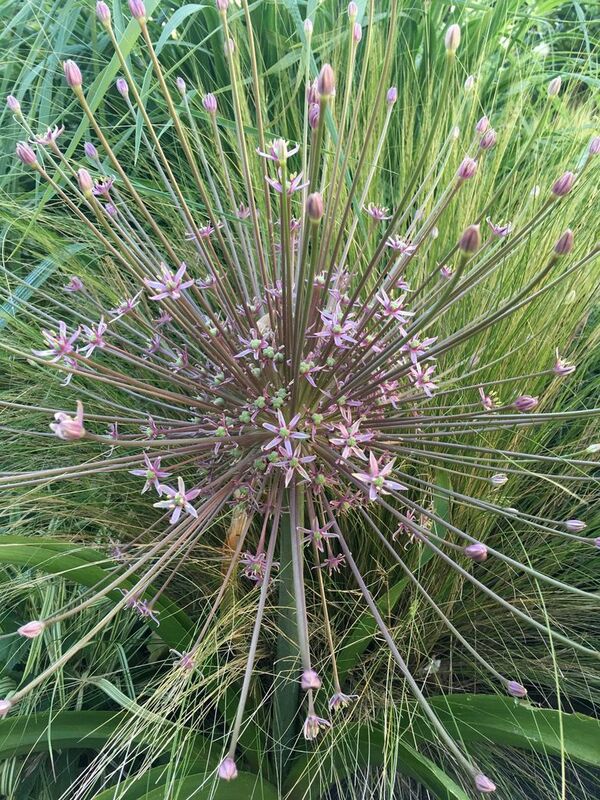 The tumbleweed onion (Allium schubertii) is even more cosmically impressive. Immense 12-to-15-inch spherical blossoms are made up of tiny florets held on stems (technically, flower stems are called pedicels) that vary in length from 1 to 8 inches long. They look like exploding floral fireworks. The tumbleweed onion blooms a bit later than its more elegantly named relative and on slightly shorter, 12-inch stems. And the show’s not over when the flowers fade. The blossoms of both of these varieties age to a tawny straw color and persist for months, adding interesting detail and a structural element to the summer garden. I’ve even been known to bedazzle my hedge by studding the evergreen yews with the sparkler-like seedheads. Brought indoors, a single dried stem in a vase makes an instant bouquet — a rather modern-looking botanical Sputnik. Allium leaves emerge early and die back just as the showy blooms erupt, potentially marring their stellar performance. Tuck the sizable round bulbs in and among perennials such as ‘Autumn Joy’ sedum, groundcover euphorbias (I refuse to call these garden-worthy plants “spurge”), purple moor grass or sedge to disguise the fading foliage and create a showy combination that lasts all summer. Alliums are long-lived and drought-tolerant, ideal players in a low-water-use landscape. As with all alliums, the bulbs have a faint oniony scent, as do the leaves when crushed. But don’t worry: Your garden won’t smell like a pizza joint. And the odoriferous bulbs are unappealing to rodents and deer; a huge plus if you’ve struggled with wildlife wreaking havoc with other bulb plantings. While you sometimes can find potted alliums in spring, I prefer to plant the bulbs in the fall. Shop local nurseries now, while selection is good, picking bulbs that are dry and firm. Don’t delay; get those bulbs in the ground so they can begin establishing roots before winter descends. In the garden, choose a location that gets plenty of sun with well-drained, even sandy, soil. Plant the bulbs about 6 to 8 inches deep in groups of three or five, or more, for a generous constellation of your own.